All flying insects, whether it be flies, bees, indian meal moths, etc., come from a source. The source can be decaying garbage or even old, rotting food or leaking water. Once the sources are eliminated and steps are taken to secure possible pest entry points, the infestations will be gone. The flies that infest structures may be discussed in five separate groups: filth flies, small flies, overwintering flies, biting flies and gnats and midges. Of these groups, only certain types of flies in the small fly group will be found regularly breeding inside structures. The other types of flies breed outside and are attracted to buildings by food odors, temperature gradients in the air, and exterior lighting. These factors affect how different fly situations will be handled. Sanitation is key to managing "filth" flies. Adults are 1/8" to 1/4" (4-8mm) long and are gray with four dark stripes lengthwise down the thorax. Mature larvae (maggots) are 1/4" to 3/8" (7-10mm) long and creamy white; their bodies taper toward the head. House flies are attracted to a wide variety of food sources, from fresh food to excrement. Adult flies have spongy mouth parts allowing them to ingest only liquid foods. Regurgitation is necessary on solid foods to liquefy them for consumption. House flies are abundant and filthy. They have been found to carry over 100 different human pathogens due to their habits of walking, vomiting, and feeding in unsanitary places as well as on human food. Additionally, house flies are a nuisance to humans and domestic animals. Bottle and blow flies are 1/8" to 5/8" (4-16mm) long as adults and 3/8" - 7/8" long as mature larvae. Bottle and blow flies are often a bright metallic green, blue or bronze, but some species are black. Flesh flies are 1/4" -1/2" long as adults and 3/8" to 3/4" (9-20 mm) long as mature larvae. 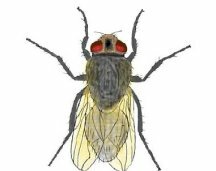 Flesh flies are dull gray to black with three longitudinal strips down the thorax, and reddish eyes. Larvae of both types of flies are creamy white; their bodies taper at the head. All of these flies develop in excrement, sewage, decaying flesh or carrion, and in similar substances. Bottle, blow, and flesh flies may transmit many serious diseases to people through food borne illness. These flies are also a nuisance to humans and domestic animals. Large numbers of these flies indoors usually indicates the presence of a dead animal such as a mouse or bird inside the structure. Also known as vinegar flies, small fruit flies are 1/8" (3 mm) long and are yellow-brown to dull, dark brown with red or orange eyes. They lay eggs in fermenting or rotting fruits, vegetables and grains as well as in wet mops, garbage and recycling bins, and any fermenting substance or liquid. Small fruit flies are a nuisance pest and commonly encountered indoors. They are abundant outdoors during warm weather and are difficult to exclude from structures with regular window screens, which they will crawl through. Sanitation is key to fruit fly management. As with most flying insect infestations, the larval breeding source needs to be located and eliminated for long term success. Existing fruit flies can then be controlled with traps and vacuuming. 1/32" to 7/16" (1-11 mm) in length, fungus gnats are dark, delicate, tiny flies that are attracted to light on computer screens or in windows. These flies feed on fungi and moist decaying matter found in rich soils. Indoor infestations can be associated with pigeon dropping or over-watered potted plants where fungi develops. In some cases, they may be breeding in moist areas associated with leaks, peeling paint, or rotting wood. Fungus gnats are typically an indication of mold or rot in the structure. When removing pigeon or bat droppings, take care to wet the area first with disinfectant to kill disease-causing organisms that could potentially be present in the droppings. 1/16" to 1/4" (2-5mm) in length, these flies resemble tiny moths due to their fuzzy, heart-shaped wings, and long antennae. Their color ranges from yellow to gray or brown to black. Larvae are thin and longer than adults with transverse dark bands across the body. Larvae and pupae inhabit the gelatinous layer that accumulates in sink and floor drains; adults are usually spotted resting on walls near drains. They are common outdoors and easily become established indoors. Moth/drain flies are primarily a nuisance that indicate poor drain maintenance. To eliminate infestations, mechanical cleaning with a wire brush is recommended over bleach (which does not work) and cleaners that do not remove the layer of scum inside drains. Specialized enzymatic cleaners that remove drain slime are recommended to manage moth flies. After the source is targeted, existing drain flies can be eliminated through vacuuming and trapping. Cracks and crevices should also be sealed to prevent organic matter accumulation, and clutter should be removed to allow for proper ongoing inspections and cleaning. Cluster flies are dull dark gray with golden hairs on the thorax and measure about 3/8" long. Abdomens have irregular light and dark patches. Cluster fly larvae are parasites of earthworms in the soil. These flies are found indoors in colder months and appear very sluggish as they fly around a room. They are attracted to windows and may accumulate in enormous numbers. They are harmless and are not a filth-carrying fly. During most of the year, cluster flies are not a problem in structures. It is only when fall approaches that they begin to enter structures in large numbers. Cluster flies begin to seek protected overwintering sites in late August and September. Adults may fly more than a mile to a site that offers shelter. They are attracted to light colored tall buildings and will invade attics or wall voids on the sunny side of the house or building and become active on warm late-winter days. The walls on the south and west sides are the ones usually affected because the late summer sun shines most on these sides. It is impossible to eliminate cluster flies outside, so you'll need to exclude them. The best and most effective method of controlling cluster flies in buildings is to prevent them from entering the building in the first place. Structural repair, caulking and fixing all window and door screens will help prevent pest entry. If clusters of flies are found on open surfaces in attics, crawlspaces, or false ceilings, the best approach would be to simply vacuum the flies from these surfaces. For extreme cases, residual pesticides may be used if required and should be applied only to non-human contact surfaces where flies are entering the structure. As always with flying pests, cleaning and sealing cracks and crevices and all other entry points is the most effective way to eliminate the cluster fly. Horse flies tend to be large flies, typically brown or black in color. The eyes of horse flies are very large and can be colorful or iridescent. Deer flies are closely related to horse flies and are generally somewhat smaller. The most common species are tan or brown in color. Horse flies and deer flies are biting flies which can and will bite people. Bites can occur on any part of the body and are very painful. Horse flies and deer flies are rarely a significant problem inside structures. These flies are most commonly found inside large commercial buildings, where overhead doors are left open to allow ventilation. Once inside, a horse fly or deer fly may land on or bite a person; but it is not very common. Outdoor control of horse or deer flies is nearly impossible because of the nature of the breeding sources and the fact that these flies will generally not seek out the same surfaces on which they rest. The best control is exclusion, to prevent them from entering the building. Doors and windows need to be kept closed unless they have proper screening. Overhead doors should be fitted with a screening device. Another exclusion method is light traps. Light traps must be properly located to maximize their effectiveness. Midges and gnats are common names for a large number of small, non-biting flies. Many species look like mosquitoes and may form annoying swarms or clouds in the air, but they do not bite. The immature stages develop in water in pools, containers, ponds, clogged rain gutters, or in some cases, wet soil or seepage areas. Most feed on living or decaying plant matter and are an important part of aquatic food chains. Many species can survive in very stagnant or polluted water. Bumble bees are big, fuzzy insects recognized by almost everyone by their robust shape and black and yellow coloration. The common species are 3/4" in length or more. Like honey bees, bumble bees live in a colony where the adults care for the young (larvae) produced by a single queen. Bumble bee nests are small compared to honey bees, as each nest contains only a few hundred individuals. Also, unlike honey bees, a bumble bee nest is annual and is used only one year and then abandoned. Bumble bees may re-appear in the same area from one year to the next but they do not reuse an old nest. 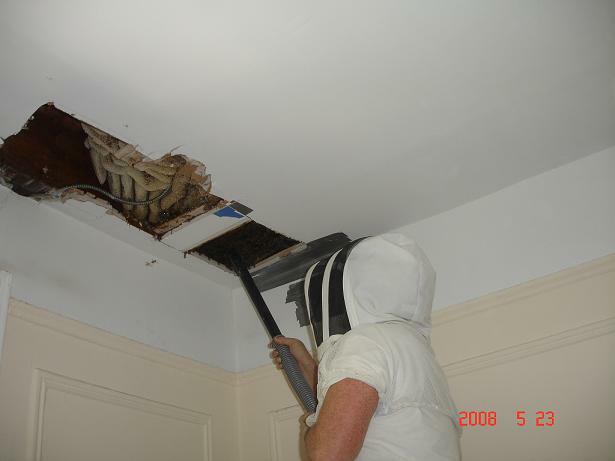 Bumble bee colonies are usually underground in a deserted mouse or bird nest though they are occasionally found within wall cavities or even in the clothes drier vent. In the spring, each new queen selects a nest site and starts a new colony. She lines the cavity with dry grass or moss and then collects pollen and nectar to produce a stored food called "bee bread." Her first brood of offspring, (5 to 20), will all be workers (daughters) who take over the colony responsibilities of nest enlargement, food gathering and storage, and feeding and caring for the larvae. The queen continues to lay eggs throughout the summer. By late summer, new reproductive males and females (kings and queens) are produced. These mate on the wing and the fertilized females move to hibernation sites in the shelter of loose bark, hollow trees or other dry, protected places to lie dormant through the winter. The males and workers still in the colony die with frost or the first hard freeze. 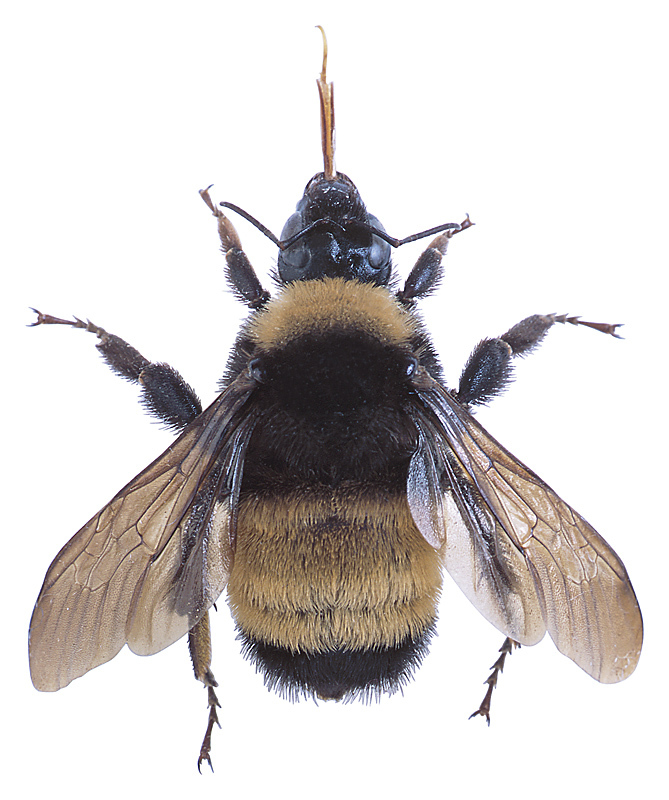 If the vicinity of a bumble bee nest can be avoided, then leave them alone and wait for them to die in the fall as the preferred "management" option. Live-trapping bumble bees for relocation is not practical and covering the nest entrance does not usually solve the problem. 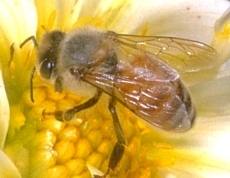 Honey bees are valuable and provide tremendous benefits, specifically pollination, honey and wax. However there are times and places where honey bees create an annoyance and a nuisance, and for sting-sensitive individuals, a health threat. One such incidence is when honey bees swarm. Swarming is a natural part of the development of a honey bee colony. Swarming is a method of propagation that occurs in response to crowding within the colony. Swarming is an advantage to the bees but is a distinct disadvantage for beekeepers. Consequently, beekeepers manage hives to reduce the incidence of swarming to the extent possible. Swarming usually occurs in late spring and early summer and begins in the warmer hours of the day. Honey bee swarms may contain several hundred to several thousand worker bees, a few drones and one queen. Swarming bees fly around briefly and then cluster on a tree limb, shrub or other object. Clusters usually remain stationary for an hour to a few days, depending on weather and the time needed to find a new nest site by scouting bees. When a suitable location for the new colony, such as a hollow tree, is found the cluster breaks up and flies to it. Honey bee swarms are not highly dangerous under most circumstances. Swarming honey bees feed prior to swarming, reducing their ability to sting. Further, bees away from the vicinity of their nest (offspring and food stores) are less defensive and are unlikely to sting unless provoked. In most situations when a honey bee swarm is found on a tree, shrub or house you do not need to do anything. Swarms are temporary and the bees will move on if you patiently ignore them. Stay back and keep others away from the swarm, but feel free to admire and appreciate the bees from a safe distance. Only if a serious health threat is present because of the location of the swarm, such as in a highly traveled public area, should you need to do anything with a cluster. An experienced beekeeper may be willing to gather the swarm and relocate it for you. Note that most beekeepers do not do this because they want the swarm; swarmers often have diseases and parasites that will be difficult to manage. Beekeepers that are willing to relocate swarms do so as a public service and may rightfully charge a fee. Click the photo below to read about Black Widow's experience with a swarm in one of their client's buildings! Carpenter bees are about 1" (25 mm). Large black and yellow bees with a shiny black abdomen and a shiny black bald spot on the thorax. Males have a yellow patch on their faces, while females have black faces. Carpenter bees are considered beneficial pollinators and are nearly harmless to humans, but females can sting if they are handled. Structural damage is done by females, which carve out dime-sized holes in exposed wood and excavate several tunnels where they lay their eggs. Over time, this may result in serious damage to structural wood. Males are quite noticeable as they hover near the galleries of working females, guarding them from intruding males. Males cannot sting. Carpenter bees overwinter as adults in wood within abandoned nest tunnels. They emerge in the spring, usually in April or May. After mating, the fertilized females excavate tunnels in wood and lay their eggs within a series of small cells. The cells are provisioned with a ball of pollen on which the larvae feed, emerging as adults in late summer. The entrance hole and tunnels are perfectly round and about the diameter of your finger. Coarse sawdust the color of fresh cut wood will often be present beneath the entry hole, and burrowing sounds may be heard from within the wood. Female carpenter bees may excavate new tunnels for egg laying, or enlarge and reuse old ones. The extent of damage to wood which has been utilized for nesting year after year may be considerable. Members of the family Vespidae include all the wasps that use cellulose fiber to build nests. This includes yellow jackets, paper wasps, bald-faced hornets and the less common European hornets. These species are usually brightly colored with yellow or white and black bodies, with the exception of the European hornet, which is brown and tan with similar patterns. Wasps have only a few hairs on their bodies. There is a constricted waist, and wasps have wings that fold along their bodies while they're resting. Vespid wasps are known for their paper carton nest-making ability, although nest styles are variable. 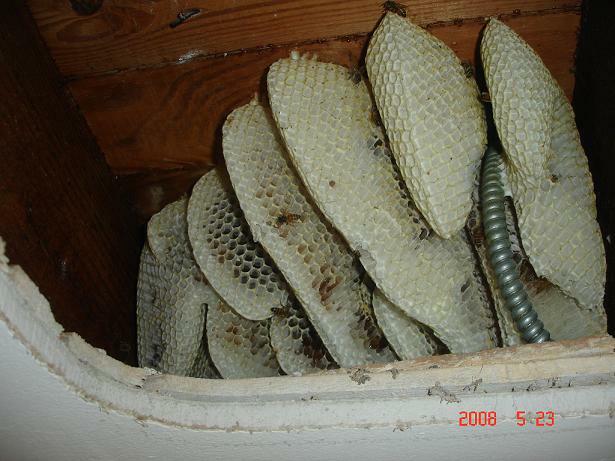 Yellow jackets inhabit cavities in wall or the ground, building combs in the protected shelter. Paper wasps build inverted combs in less sheltered locations, usually under overhangs or in dense vegetation. European hornets and bald-faced hornets, which are actually large yellow jackets, create the football-shaped, fully enclosed nests that can be found in exposed locations such as in tree tops or on the sides of buildings. Vespid wasps capture soft-bodied insects for larval food, and are considered beneficial insects (unless they're found near people). Then they may pose a real threat. Their stings are painful and can result in serious illness or death for some allergic individuals. Old or pesticide-treated yellow jacket nests can attract carpet or hide beetles, too. Social wasps such as the hornets and paper wasps live in colonies in a fashion similar to the honey bees and ants. Most of the wasps in a colony are workers; i.e., the nest queen's nonreproductive daughters that build the nest, gather food and care for the queen's offspring. Hornets build the familiar large nests of a paper-like material made from chewed wood mixed with saliva. Nests contain many tiers of cells covered by the outer shell with a single opening at the bottom. Hornet nests are usually located in wooded areas, attached to a tree branch, but may be attached to shrubs, utility poles or house siding. Each nest has only a few hundred workers that are about an inch long and dark with white, light yellow or cream colored markings on the abdomen, thorax, and face. Hornets can be aroused to sting in great numbers, but only when the nest is disturbed or threatened. Paper wasps build the familiar umbrella shaped nests found hanging by a short stalk on the undersides of building eaves. Only a single tier of cells is constructed and there is no external covering over the nest. Each colony normally contains fewer than 25 wasps, but late in the season, the number may swell to over 100. Paper wasps are slightly longer and more slender than yellowjackets, and color is variable among the many species. A social wasp colony lasts only 1 year. Paper wasps and hornets build a new nest from scratch each year and do not reuse the previous year's nest. The only wasps to overwinter are the fertilized queens. All the workers from a colony die with the first frosts. Late summer is the time of year when populations of yellowjackets (commonly called "bees") and other social wasps become large and noticeable. The wasps have been present since spring, but because colonies start as a single queen in May, populations are very small through the early part of the summer. Yellow jackets build paper nests similar to hornets, but either in the ground, a log or landscape timber or building wall or attic. Yellowjackets are commonly observed hovering back and forth at the small nest opening or around garbage cans and other areas where they forage for food. The workers from the colony travel up to a few hundred yards from the nest while looking for food. In the early summer the wasps forage for caterpillars and other "meat" items, but in the fall prefer sweets such as pop and candy residue in garbage cans. The Indian Meal Moth (IMM), a stored product pest, is approximately 1/2"–1” (12–24 mm) wide from wingtip to wingtip. Larvae vary by species from 3/10"– 4/5” (7–20 mm) long. Adult moths are silvery gray to copper. They hold their wings alongside the body, making them look much smaller. Larvae are white to yellow with darker head and mouth parts. Dried fruits, grains, corn, pet food, chocolate, nuts, and seeds are a few of the products that these moth larvae will eat. Adults cause no direct damage other than laying eggs in stored products. Sanitation is key to eliminating IMM infestations. Without food or grains available to eat, the IMM cannot survive and will die off or leave to find other resources. Once the source is eliminated, existing moths can be cleaned up through vacuuming and trapping.